Enjoy the best of both worlds. The natural beauty and tranquility of the country while being minutes from Whangarei. Our property is 7 minutes from Kamo with cafes, shops and amenities, 12 minutes to the CBD, and 4 minutes to State Highway 1. A great place to use as a base for exploring Whangarei and the wider region - Whangarei Heads, Tutukaka Coast, Bay of Islands, Kauri Coast, Kai Iwi Lakes, Waipu. Or the perfect stop over for your far North adventures. Beautiful bush/garden and mountain views from the large windows and sliding doors in the living area, bedroom and courtyard. Listen to the birds and enjoy all day sun in the garden with the north facing aspect. Guests have use of the car port and their own entrance way to this downstairs space. Keys will be provided so you can come and go as you please. The bedroom boasts a very comfortable, top of the range Sleepyhead king bed with an electric blanket. A Porta-cot with mattress can also be made available for your little one (cot linen to be provided by guest). Self-contained, the kitchenette comes equipped with a generous sized fridge, microwave, kettle, toaster, toasted sandwich maker, all crockery and cutlery (no oven or hob). Coffee and tea provided. The bathroom has a shower, toilet, basin, heated towel rail, and tiled underfloor heating if you wish to make use of this. An iron and ironing board can be made available as well upon request. The living area has a large table and comes with four chairs. We have Freeview TV and a blue ray DVD player. A selection of DVDs and books are there for guests to use. A DVS ventilation system operates, with a convection heater for heating. We love this space and think it is unique and beautiful. We hope you do to! * We consider this a child friendly place, with a trampoline and toys for preschoolers. Families are welcome! (though we ask that the space be respected and left in a tidy and clean condition). * We are a small family living upstairs. You will hear us from time to time, though we are mindful of our guests privacy and of our sound levels. * This is a strictly no smoking environment (indoors and outdoors on the property). If you wish to smoke then please do so in the street. We are a small, lively family of three. We love living in Whangarei. Our interests include walking/tramping and other outdoorsy activities. As well as chilling at home and watching movies. Being keen travellers ourselves we have been to many destinations. So far, top of the list have been Vietnam and Spain. Teresa's latest experienced was a short trip to India. We moved from Auckland to Ian's hometown of Whangarei for it's slower paced lifestyle. We love that our home is in a spacious, quiet, rural setting. Perfect for day trips to Whangarei Heads, the Tutukaka Coast, Bay of Islands, the Kauri Coast, and Bream Bay Coast. The owners are lovely and helpful, the place was very cosy and quiet even though the owners live above it. Would highly recommend if you wanting a nice place to relax while wondering around Whangarei! Beautiful outlook over Hikurangi lowlands and bush clad peaks. Beautiful outlook over Hikurangi lowlands and bush clad peaks. Set in urban periphery on quiet no exit road all day Sunday with sheltered terrace where we talked and enjoyed the plunger coffee. Well appointed lounge kitchen and quality king size pocket spring bed in the large bedroom. Heated tile floor in bathroom was nice. The apartment was easy to heat with the panel heater, good quality curtains and considerate hosts above made for a comfortable midwinter break. A lovely, spacious and quiet apartment with pretty much everything you could want. A lovely, spacious and quiet apartment with pretty much everything you could want. Very clean, very comfy bed and appealing decor throughout. So nice to wake up in the morning and look out at the hills in the background. Operating the TV/DVD was a bit of a challenge at first but the helpful "welcome" book had detailed instructions so we go there without much trouble. Nice little granny flat. Well equipped nicely furnished. Quiet clean and tidy. Had a wonderful stay! 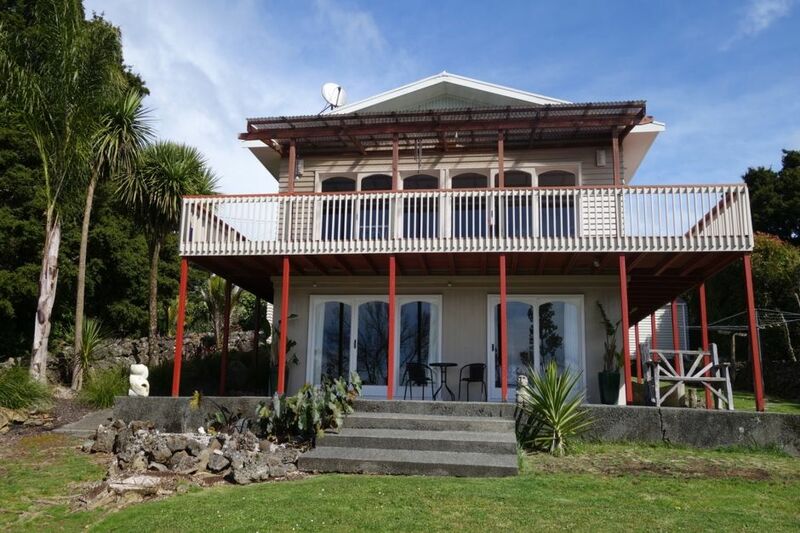 Very nice and clean and comfortable accommodation with great views above Whangarei. Would highly recommend staying here. The property was beautiful, spotlessly clean and the outlook very peaceful and quiet.